PrinterLogic is a single enterprise print management solution. Yet every organization's printing initiatives are different. Very different, as a matter of fact. That's one of the reasons why the independent research firm TechValidate approached PrinterLogic customers and polled them about their printing initiatives (TVID: 87C-4E7-80A)—just to see if PrinterLogic was indeed as versatile as they suspected. Not surprisingly, the responses to the multiple-answer TechValidate survey ran the gamut and were also fairly well distributed between the various choices. The top initiative by a wide margin—70% of the nearly 200 respondents—was reducing printing infrastructure. And then the next most popular initiatives started to cluster: print job costing (40%), supporting mobile printing and reducing the number of print jobs (both with 34%) followed by increasing printing security (30%). So how does PrinterLogic help these diverse organizations accomplish their top five printing initiatives? Reducing printing infrastructure: By allowing enterprise print environments of all kinds to eliminate print servers while actually introducing greater ease of use and functionality, PrinterLogic shrinks server infrastructure exponentially. Even distributed organizations that thought print servers were utterly essential have been amazed to discover that implementing PrinterLogic enabled them to forego print servers without missing a beat, saving them the headache and costs of purchase, maintenance, operation and upgrade. Print job costing: Print consumables (e.g., paper, toner) are a major organizational expense, but it's difficult to get a solid quantifiable fix on usage. PrinterLogic changes all that. Its print job auditing feature gives you both a macro- and micro-level view of your print environment so you can see, for example, how many pages a given department has printed within a certain timeframe or which users are consistently printing the largest jobs. These numbers let you target usage and put a cap on runaway print costs. Supporting mobile printing: Mobile printing is so tricky to implement properly that many organizations have a limited stopgap solution in place, provided they have any solution in place at all. PrinterLogic's Mobile Printing solution quickly and easily enables full-featured mobile printing from any mobile device to any printer (even legacy devices)—all without having to install any client software. And it's just as straightforward for BYOD users and guests too. Reducing number of print jobs: As with print job costing above, PrinterLogic's print job auditing feature offers unprecedented visibility onto your print environment—whether it's at the 10,000-foot level or with an eye to a specific printer anywhere in the organization. With this hard data in hand, you can adopt new departmental or enterprise-wide policies to help raise awareness about printing more efficiently, as many PrinterLogic customers have already done with outstanding results. Increasing printing security: At PrinterLogic, we think ease of use is key to encouraging end users to make security part of their workflow. That's why our Secure Printing feature provides three convenient printing release mechanisms that slot right into your existing environment: Browser-based release via a PC, Mac, Chromebook or mobile device; badge-/card-reader release as part of your current badge system; and printer control panel release right from the printer's LCD. 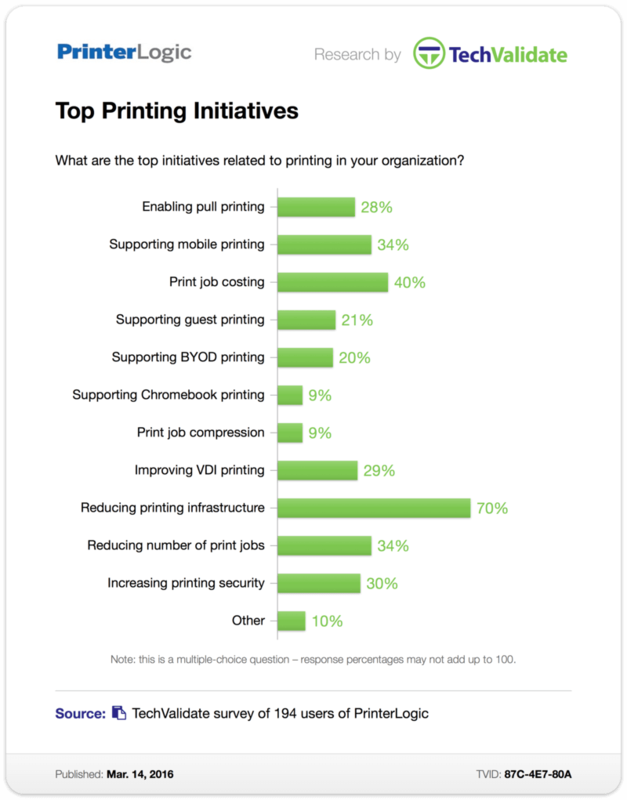 We realize that enterprise printing initiatives are as varied as our customers—as this TechValidate survey shows. That's why we've created such a versatile printing solution that is capable of delivering manifold benefits through a single streamlined deployment.